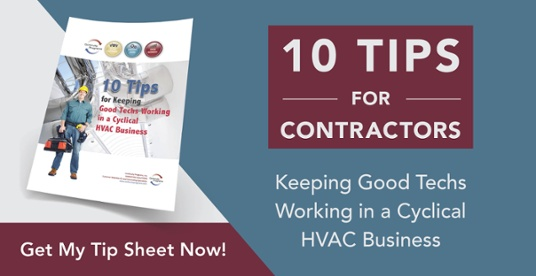 As a contractor business, your marketing and sales can work differently from many other types of businesses. That’s why it’s so important to work closely with professional marketing partners who understand how your business structure works and how to generate new leads and customers for your business. At Continuity Programs, we have built an entire marketing system specifically for contractors because we understand what you need to help grow your business and increase revenue. Let’s take a walk through how our contractor marketing system works. Using your database of customers and potential leads, we send out mail and email marketing content regularly to stay top of mind. Our database program can be custom designed with your company branding for every occasion. Send a thank you card, online satisfaction surveys, and postcards and emails throughout the year. We can even send seasonal reminders to current and returning customers to remind them to get their systems serviced. We have three different Connections Programs: three years, five years, and seven years. This program is designed to help you generate more referrals and repeat business from your customers throughout the year. If you’ve worked in a particular neighborhood a few times before, this program is perfect for you. It sends out mailings to the houses and neighborhoods surrounding your current customers to help you win even more customers! The first step is scheduling a 30-60 minute no obligation demo on how our system works and what it can do for your business. Seeing is believing, and there’s no better way to start believing that we can help you grow your business than by watching our product demo. 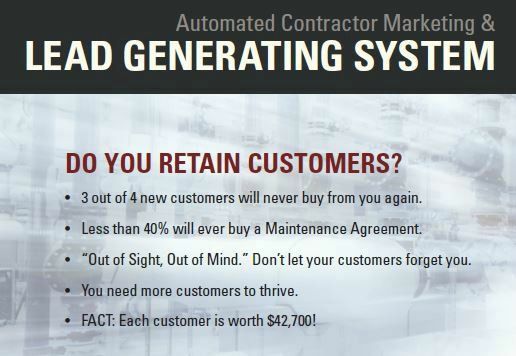 Working with Continuity Programs and our contractor marketing system is one of the best ways to consistently generate new leads and send out automated marketing to your current and returning customers. Get started today!